It has been a rainy,grey day here. Not what I think of for Easter morning…but it did not put a damper on the reality. Christ broke the barriers. It is done. He has risen. The Weight of Good Friday. What have I done on this Good Friday? Cleaned…working on cleaning out closets. Looked through old papers and remembered moments in our lives. Pictures of the kids as they grow. Smiles and joy and a happy life overall. Between the cleaning, I’ve talked to the kids, checked in on FaceBook. Talked on the phone to the one I love. This day has not stood out. In the corners of my soul there has been this present thought throughout the day…make space. This day is not just another day. This day will culminate for me at our Good Friday service at church, and in a way I have been pushing off that thought from the corner of my soul. Waiting for the space to be made where I can be silent and I can listen. I can think about the utter astounding truth of Good Friday. Still…what about right now, in the midst of this normal day? How do I make the room in the midst of a ‘normal’ day…a holiday even…to think about the crushing significance of the Cross. How do I put the brakes on and silence the distractions so that I can pay attention? Easter is coming…and I’m filled with gratitude….but I do not want to miss this moment. The weight of the sacrifice. The weight of the cost. The weight….of the God of the Universe wrapped in flesh and breaking the barriers. Honestly, it makes me uncomfortable because it is impossible to process the reality of Good Friday without understanding the weight of our sin. That is not something that can be done casually or just in passing. That requires our attention and our focus. 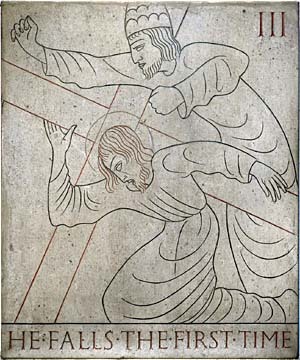 Malcolm Guite has a sonnet for each stage of the stations of the Cross. I highly recommend going by his site and reading…taking the time to let them soak in. This one has had my attention as I’ve been trying to push back the duties of the day to listen….I’m sure I’ll have more thoughts after the service tonight. There is something just beyond my grasp in the picture of the last supper…that scene with all the disciples who had to be confused. Shouts of Hosanna and a crowd that seemed to embrace Jesus…but did not understand Him. He knew. The disciples had to be so perplexed. Jesus tells them that His time has come, that He is leaving them…and there had to be such a panic at that moment. What on earth did that mean? When I was young I used to think that although Jesus died on the Cross, and I was sure that was painful…that He went through the whole experience with a sense of aloofness. I had this picture in my mind that He knew what He was here to do, and that He was God, so He was somehow a bit removed from the whole process. I was wrong. He was never aloof. He was immersed in what it is to be human, and part of that immersion…incarnation…was to feel the pain of betrayal and the stress of facing an overwhelming task. He was troubled in His Spirit. He knew what was coming, and this verse comes just before He reveals that He will be betrayed. With full knowledge, with full understanding…He meets us here. He knows we will betray Him. He knows we are caught up in wrong motivations, in sin, in a love that is never pure…and yet. He overcomes all our barriers. It was not done with callousness or with simply a dutiful mindset. He was troubled by the betrayal of Judas, and He showed the depth of His struggle in the Garden. He was God and He was man and He understands how difficult our struggles can be. That is astounding to me and even after 30 years of following Him, it is still difficult to get my mind to grasp. The story is so familiar and sometimes it is easy to simply make our way through the paces and the verses and dress up for Easter…but remember that He was troubled in His Spirit. He was impacted and knows the pain of betrayal. He is not soft, this God…not in the sense of being weak…but He is compassionate and He is loving and He is impacted by our betrayal. Still He meets us here and loves us into light. Yesterday I said that God was not soft. He is strong and He is just…and there is an awe and a fear of Him that is right and is good and is healthy. The righteousness of God not only exposes my lack, and my need, but draws me toward Him as I become aware of who He is. True justice, true righteousness. Truth. However, if God was only just and righteous and strong…I wonder if He would be approachable. On my FaceBook feed there was a little discussion about how we need a God who is able to deal with our shame and our condemnation. We need Him not only to deal with it, but we need to be able to face Him and to draw near to Him. So, the God of the Bible is not soft in the sense that He is wishy-washy or inept. He is, however compassionate and filled with grace. He is approachable. God, in flesh, has made Himself approachable. On Easter we will celebrate the breaking of the barriers and the sacrifice paid so that we can approach God. So that we can enter His presence with boldness. Today, in the progress through the Holy Week we recognize that moment of intimacy. That moment of approach. This actually happened the day before Jesus entered Jerusalem…just before the shouts of Hosanna. A quiet recognition before the more fickle and loud recognition. God allowed Mary to express her friendship with him in a lavish display…but he did not mock her or belittle her or turn her away in her expression. He allowed her to approach Him. Jesus, incarnate….He is not soft and He is not inept….but He is not callous and He is not unapproachable. The barriers are broken and we may enter His presence with boldness…with timidity…with affection…with friendship. My “Temple” is filled with unclean things. Distractions, motivations that are impure. My imagination is caught up so often in things that draw me away from God rather than toward Him. I am, frankly, weak and lacking in discipline and in focus. I am in need. I am broken by a sinful nature that does me in, and by an enemy who would rejoice in my defeat. I need not a soft God who is only love and who demands little. A God who would simply bless me in my choices and my way. I need a God who demands holiness and who knows true justice. I need a God who will clean this temple, and I, in my lack of imagination, need a God I can “see”. I need something more than a God of wood or stone that I can gaze upon…I need a God who walks and talks and surprises me. I need Jesus. I need Jesus who touched lepers with tenderness, who wept at His friend’s death. I need Jesus who knows loneliness and pain and suffering, and yet who knows wonder and imagination and love and joy. This week I am following the posts of Malcolm Guite, and I am thankful for the poet and the artist and the musicians who bring to life the emotions and the words that fail me. 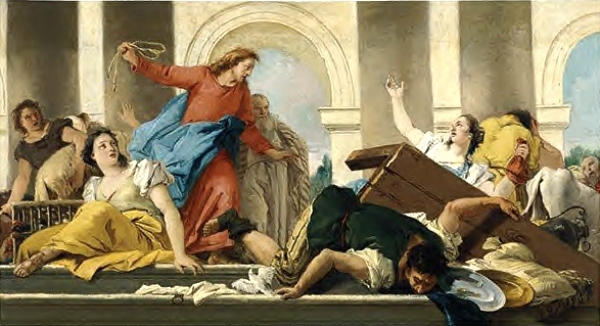 Today his post is about the cleansing of the Temple. This is the God in whom I put my faith and my trust…and my need. The God who is willing and able to act justly and to save and to redeem and to cleanse. The God who will break the barriers. Begin in me for good, the pure change. Teach me again to whom my love is due. And tear the veil in two with your last breath. As I was writing this I was thinking of the strength of our God, and I came across Steve Green singing A Mighty Fortress. Put on your headphones and turn this up loudly. This is not a soft God who gives us up to our ways. This is a God who faces down the fear the shame and the danger. This is the God who tears the veil in two. The Grasping of Palm Sunday…. This poem is from Malcolm Guite, part of his book Sounding the Seasons. This was just what I needed to hear this morning. I said the other day that I felt unprepared for the Lenten Season this year. In the past I have been more intentional about giving something up, even just FaceBook, in an attempt to focus on the season. The intentional abstaining is not an attempt to gain the merit of God, it is instead an attempt to discipline this flesh of mine to focus on the reality of a God who became man, who conquered all through the ultimate humbling and sacrifice. The God who redeemed. Redeemed all…but also me. Sometimes that is still difficult to contain in this brain of mine. This hardness of heart and fickleness that mark me, more than faithfulness and tender heartedness. These barriers that I continue to let stand. I needed to hear a soft word today that recognizes that following Jesus is not simple, although there are moments of great praise and worship…there is also the moment of confusion and of reversal. The moment when God does the unexpected and does not simply ride in and conquer all the enemies. The moment when we wonder what God is doing. Palm Sunday is that day when we grasp hold of the idea of a Messiah who rides in and understands all our pain and suffering and fears and hopes…and we cling to the idea that He will change everything. We cheer and we hope and grasp. He does change everything, but it won’t be the way we expect. He broke all the expectations in His death and in His Resurrection…and He continues to break my expectations. It is good to grasp hold of Him and to cheer and to hope….but to do so with caution and with understanding that His plan may completely reverse what we think should happen. His plan, though….it will utterly change everything. Sunroof open, music blaring, taco eating kind of day! Okay, if you were out today and saw a big blue truck go by and were suddenly assaulted by loud music accompanied by, well, less-than-perfect singing….I apologize. Today has been a fantastically restoring day. The kids went to their tutorial, and I…to the coffee shop. 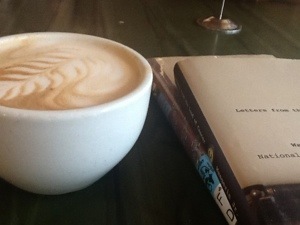 I started out at Bongo Java, where I read and journaled and sipped coffee. This is in a neighborhood where, well, my Mom in her sane days probably would not have wanted to frequent. I walked in and there was a man in line with his wife, who I probably would have avoided if I had Maddie with me. He was missing one leg, and was blind in one eye. He was black. When it was time for him to pay his $18 tab he found it they don’t take cards. He was going to have to walk (on crutches, missing a leg) to a nearby ATM. I am not exactly in the position of lots of extra cash at the moment….but I had enough in my pocket to buy his and his wife’s meal if I was careful with my meal. So I did. He turned around and thanked me, and blessed me. This rather disheveled, crippled man said, “God bless you, Sarah.” He had asked my name. 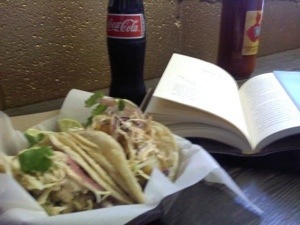 And I knew very clearly that I had made the right decision and it didn’t matter if I only got one taco. Then I ordered and the place gave me my meal for free. And I was blessed….and the day continued to revive my soul. I have been diligent in getting through the tasks of the day, but I have done so with little joy and with more stress because I was viewing the day from the view of tasks to be accomplished. Today was all about enjoying the moment and the place. Today was about a playlist selected specifically for songs that could be played loudly and sung along to with vigor…the kinds of songs that require the windows to be lowered and the sunroof open. The kids need this version of me…the fully awake, ready to embrace the day me. I know that I will not be able to be is person everyday…but that doesn’t mean I don’t seek it and try to be in this space. There is so much they will learn about the evil that is in our world…so much about atrocities and hurt that we have committed. I cannot teach them history without their learning these things. Right now though, in these moments where they are still innocent…now is the time to flood them with wonders and joys and glorious things that grab their attention, so that when they face the atrocities they have wonder to balance things. So. On the list for the rest of this week…for the rest of the school year…more giggles, more dance parties with songs that get their blood pumping and require singing along. More play along with the math and the language. More stories that spark the imagination. More trips to the park. More joy…more intentional seeking out of joy.